Pierre Arcand, minister of energy and natural resources and minister responsible for the Northern Plan, and Eric Martel, president and CEO of Hydro-Quebec, with an Electric Circuit charger. There are 14 charge stations planned along highway 401, 416, 417 and 17. The Electric Circuit is the largest public electric vehicle charging network in Quebec. It comprises 620 public stations, including 31 fast-charge stations across 16 regions of the province. Since its launch in March 2012, 136 private and institutional partners have joined the Electric Circuit, and the network now has more than 7,000 members. Last May, the company announced an extension of its network to Ottawa. There will be a fast-charge, 400-volt corridor between Quebec and the Ottawa area, with charger locations selected by the Government of Ontario. The project, supported by public and private partners, calls for the commissioning of 14 fast-charge stations along highways 401, 416, 417 and 17 by 2017. An additional eight 240-V (Level-2) charging stations are also planned at strategic locations around Ottawa. The Electric Circuit, a subsidiary of Hydro-Quebec, submitted a joint bid with Metro, St-Hubert restaurants and the City of Ottawa, which will install charging stations on its properties. The charging stations will be manufactured by the Electric Circuit’s supplier, Quebec-based AddEnergie. 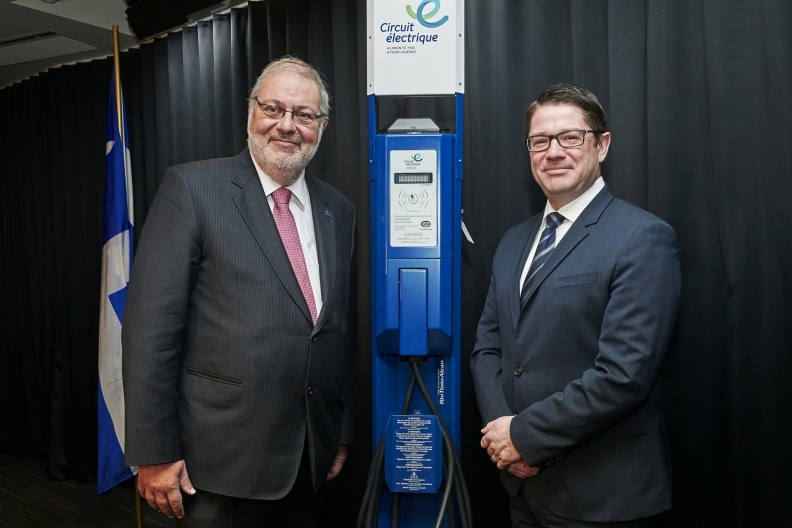 According to the minister of energy and natural resources and minister responsible for the Northern Plan, Pierre Arcand, the Quebec government is strongly committed to transportation electrification with a plan for zero emission vehicles underway in the fall of 2016. “As Canada’s first public charging network, the Electric Circuit is an excellent example, demonstrating our leadership in this area,” said Arcand. Quebec wants to have 100,000 electric vehicles on the road by 2020. For now Quebec, which bought half of the Canadian electric vehicle fleet last year, was at 9,743 electrified cars at the end of April, still far from the objective. “The installation of charging stations along highways is another argument to convince future car buyers to make the switch to EVs,” said Quebec transportation minister, Jacques Daoust, also minister of transportation, sustainable mobility and transportation electrification. According to Electric Circuit president, France Lampron, the joint venture is the first step of a bigger plan between Quebec and Ontario. This is a great recognition of the Electric Circuit‘s expertise and the quality of service it offers EV drivers,” added Eric Martel, CEO of Hydro-Quebec. Though it hasn’t said so specifically, speculation is that Hydro-Quebec is now aiming at Montréal-to-Toronto, the heavily travelled corridor between Quebec and Ontario, and the heaviest traffic corridor in Canada, to pursue it’s mission.